Have you ever dreamed of visiting every Lighthouse and Life-Saving station on the Great Lakes? The Reverend William H. Law did just that and more in the early days of the twentieth century. Rescued by a U.S. Life-Saving Service crew on Lake Huron in 1900, Law dedicated his life’s work to serving the men and women stationed at Light and Life-Saving stations throughout the United States. Whether it was bringing his “Floating Library” to stations located on the Great Lakes, regular correspondence with the crews of stations far too remote for a personal visit, or his relentless pursuit of Congress to approve a bill to provide better pay and pensions, Reverend Law became a fast friend to those serving in the Lighthouse and Life-Saving services. “Sky Pilot” was sailors’ slang for a chaplain. 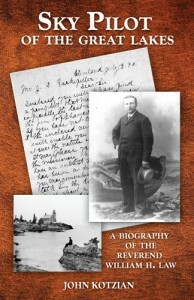 To the men and women he served, Reverend Law was lovingly known as “The Sky Pilot of the Great Lakes.” A tale of unconquerable optimism, the story of W. H. Law’s life is as much the account of the brave men and women of the Lighthouse Service and Life-Saving Service as it is the saga of a long and rewarding life in the service of others. Watch actor Larry Rink portray William H. Law, a traveling preacher to lighthouse keepers. This performance is from the Historical Society of Michigan’s 2016 Michigan in Perspective History Conference.